I was called out to a customer’s house to deal with a rat problem they had. The owner was concerned that the rats may chew through the electrical wires etc. The property I was going to was on the northside of Brisbane in the suburb of Wooloowin. Every time I do a pest treatment on the north side of Brisbane I thank the lord the Gateway Bridge was built. Using the Gateway Bridge saves a heap of time in travel. I live on the south side of Brisbane but work in all suburbs. Because of the Gateway and the many tunnels around Brisbane now, they make the city much faster to get around in. But anyway back to the job at hand, this customer was having issues with rats. Rats are a common problem in all cities around the world. They spread all sorts of disease and can do serious damage to a building. When carrying out a rat pest control treatment in any of Brisbane’s northside suburbs it’s important that all areas are inspected around the property. The idea of doing a thorough inspection is to look for signs where they could be entering the property. One very important place to check in all houses is the roof-void. 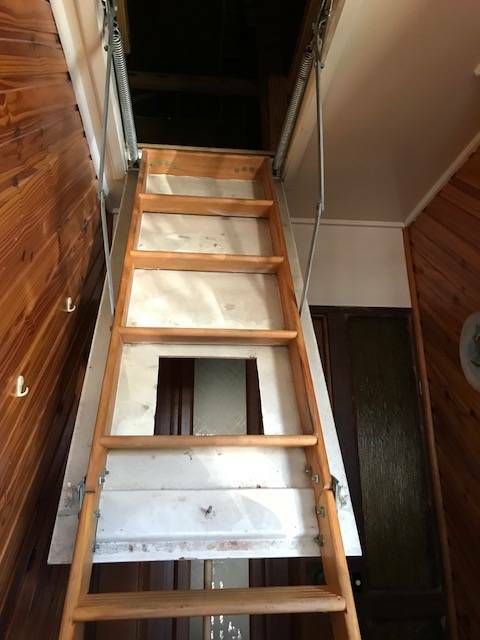 The picture right is the stairway into the roof void. I did say to the customer at the time that this is the best access to a roof-void I’ve had in a long time. Usually climbing into a roof-void through a small man-hole cover can be a bit of a challenge. So I was pretty happy to see this one, and I didn’t even have to take my ladder off the truck. This customer was telling me that he has motoneurons disease. He built this access himself some years ago but now finds it hard to get up there due to his condition. I told him not to worry I will sort the whole thing out for him. So I climbed into the roof-void to check for any signs of rodents. The first thing I noticed was that some of the air-conditioning duct-work had been chewed. This was a sure sign that rats wherein the roof-void. They were probably making their way in via the guttering on the house. Rats are awesome climbers and if there’s an over-hanging tree branch or bush close by that will be their way in. Rats and mice can squeeze through very small holes so to keep them out all areas need to be sealed properly. Along with checking the roof-void, the external of the house needs to also be checked. On the outside, we are looking for any type of entry point into the house that a rat or mouse could use to gain access. Once the first treatment is complete it is very important to arrange a follow-up inspection. Where rodents are concerned it’s best to check the bait stations after about a week. Checking rodent bait stations will give us a good idea of how much activity there is with rodents. We can determine how bigger problem there is with rodents depending on how much of the bait has gone. It may be necessary to refill the stations if all of the baits have been eaten. The second callout visit is free with Sunnystate Pest Control Services. We like to ensure our customers get the very best support until the pest problem has been fully eliminated. Anyway after the second visit all was well and the customer had not heard any more noises in the roof or the wall cavities. Although the rat problem for this customer is now over it’s important they carry out repairs to stop the problem from returning. We’ll now have a look at some other areas of a pest extermination treatment for Brisbane northside customers and also the importance of a regular termite inspection. General pest control services include pests like cockroaches, silverfish, spiders, ants and rodents. Quality service should also come with a 12-month warranty. Some warranties will vary depending of course on the type of pest being dealt with. There’s a good mix of houses and units on the northside of Brisbane. So this means that Pest control prices will also vary depending on the building type. It wouldn’t be fair to charge a customer in a small unit, the same price as a customer in a house. The pest control company you deal with should ask over the phone what type of property you live in. This way the right pest control price can be given without confusion. There are plenty of pest control companies on the northside of Brisbane and they should also find out early on whether you have any serious problems with a particular pest. The more information that is given over the phone the better the end service will be. What Areas of a Home Get Treated In a Pest Control Brisbane Northside Service? With a general pest control, it should include both the internal and external of the home. This is the best way to help bring pest problems under control. Only treating part of a home is not good practice for any pest eradication company. For instance areas around the garden should be treated especially if there are issues with pests like ants. Ants can get into just about anything in and around a home. So a thorough treatment of all accessible areas is very important. While the outside treatment is being done it’s a good idea to have sheds and garages open. These are can harbour all sorts of pests so getting them treated is a great idea. Sheds and garages should be part of the general pest treatment for the home and shouldn’t cost any more. Obviously, if a property has multiple extra buildings there could be an extra charge involved. So it’s important to explain your situation on the phone before booking. For the inside of a home, all kitchen cupboards should be checked and treated as needed. There are many different ways to treat cupboards these days, so there’s no need for them all to be emptied. But when a home is empty all the cupboards should be sprayed with a liquid insecticide. Also, a cockroach gel should be placed in them for a longer lasting treatment period. There are gels and dust that can be used inside kitchen cupboards instead of or with liquid sprays. The gels will help to get rid of cockroaches and the dust will help to get rid of all manner of pests. The dust used by technicians looks like talcum powder and is very good for long-term effects on pests. It can be placed under appliances on cupboard hinges and hard to reach places. When applied by an experienced pest controller the customer won’t even know it’s there. Other areas that get treated are skirting boards and roof-voids. Many pests harbour in the roof-void and many use the edge of the skirting as a means of transport. Getting the products into the right places is the most important aspect of any pest control service being carried out in Brisbane. Now we come on to one of my favourite topics and that’s termites. An annual termite inspection is an absolute must for all homeowners. I mention this in many of my blogs and the reason being is it can save a person a heap of heartache. I have been called out to many homes with termite damage and it’s never a good thing for the customer. The worst part about most termite damage is that it could well have been prevented by just having a termite inspection done. It is recommended by the Australian standards to have a termite inspection every 12-months. This is regardless of whether there is a full termite barrier installed. Many people think that because they have a full termite barrier around their home they don’t need an inspection. This is a dangerous way to be thinking if you own a home, don’t risk it. A termite inspection can be arranged at the same time as when a pest control Brisbane northside treatment is done. When booking two services at the same time it can save the customer money. 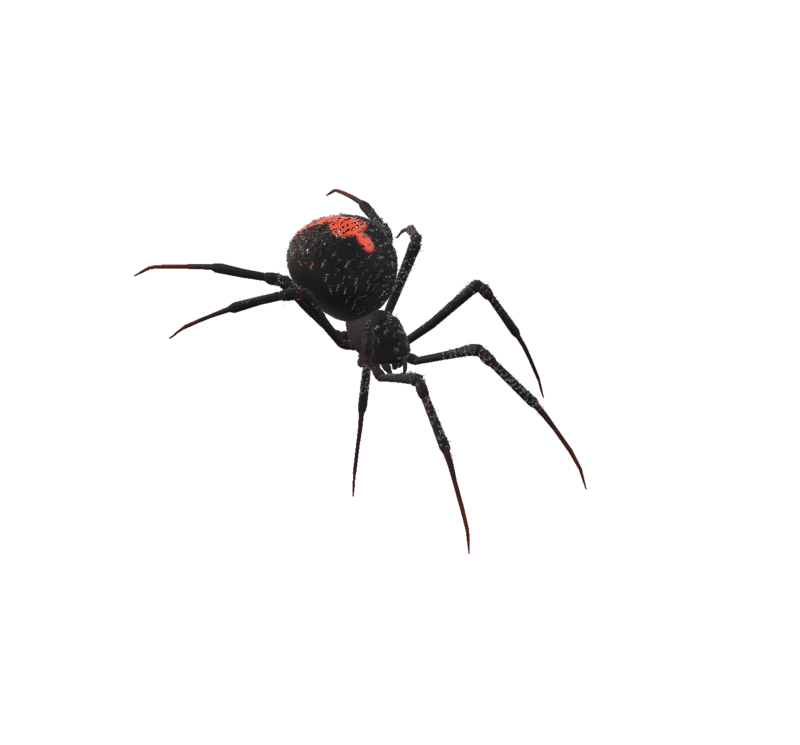 At Sunnystate Pest Control we give discount prices when two services are booked together. When a professional termite inspection is carried out it will take between 1.5 and 2 hours to complete. It’s important that all areas of the home being inspected are checked thoroughly. An inspection will start on the outside and then the internal will be checked. The garden area is a very important place to check as this can give signs to early problems. If termites are found in the garden they can be destroyed before they get to the main property. On the inside of a property, every room should be inspected and this includes roof-voids and sub-floors. The roof-void and sub-floor are areas where most termite damage is encountered. Always use a professional company to do your termite inspections and make sure they have a license. There are two types of pest license one allows for general pest extermination only and the other allows for termites as well. Make sure your termite inspector is properly trained, licensed and insured. It’s also best to try and use a company that has a thermal imaging camera to check for termites. 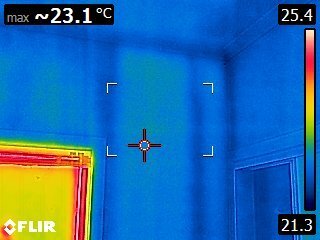 A thermal imaging camera is a great way to check for termite activity in wall cavities. For any further information about termites please don’t hesitate to contact us here at Sunnystate. The liquid sprays that pest technicians use can be used both inside and outside. There are limitations on some products so the label has to be understood. It’s the responsibility of the pest controller to understand the label properly. Most of the products used in the pest industry these days are odourless and safe for the family and pets. But care still has to be taken when using them; this is why it’s important to always use a licensed professional. There are plenty of different pest sprays on the market today and using the right one is important. Your local northside pest control company should know what can and can’t be used. Some products cannot be used when treating the inside of a residential home. Again this is something your pest technician should know. When applied by a licensed pest professional all products use will be absolutely fine and should cause no issues. Where problems arise with pest treatment is when an unlicensed person is called out to do the pest control service. You should always ask to see the technician’s license before they start the job. Before your pest service is due it is a good idea to pick up pets bowls. They can be placed back down after the treatment has been completed. Removing any pet food and drinking bowls is the safest way to ensure your pets are safe. If there are fish tanks of any kind including turtle tanks the filters should be switched off. It’s also highly recommended to place a towel over the tank until the service is finish. The towel will ensure that no sprays can land in the water of a fish tank. Sprays of any kind used in the pest industry will kill aquatic life very fast. So just to recap the best way to ensure you get a proper pest control treatment on the northside of Brisbane is hire a licensed professional. Also, don’t be afraid to ask the question, are you fully licensed and if necessary ask to see their license. It’s very hard to know if you are getting a professional service or not until after it’s complete. Always get a receipt for your service and make sure it has marked down what was used and how long the warranties are for. Finally make sure you get your annual termite inspection done, as it could save your home and your wallet. I hope this article has been informative you can leave your comments down below.